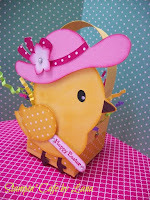 She is such a little cutie that I thought I would use the same chick from Create a Critter 2 and make a card. For the card, I cut the chick and coordinating layers at 2-1/2 inches, cut from Blushing Bride cardstock (Stampin' Up). The hat is cut from Mint Macaron, and the band and wing are from a retired patterned paper stack (polka dot in Pink Pirouette, also Stampin' Up). The patterned paper is from the Birthday Bouquet DSP (SU), Since both sides of the paper are so pretty, I decided to turn down the righthand corner to give a peek at it and added some punched out small flowers (punch is EK Success). I just used a black marker to make the dots in the middle of the flowers. The "happy easter" greeting is from a retired Stampin' Up set called Delightful Dozen." It was and still is one of my favorite and most versatile greeting stamp sets. The greeting is punched out with an oval punch. I used pink ink to ink around the edge of the oval and then added some rhinestones. Finished card size is 4-1/4 x 5-1/2 inches. Card base is Mint Macaron. Layers are in white and the then the patterned DSP, each cut 1/8 inch smaller than the previous layer. I used dimensionals to lift up the little chick from the card to give her more "life." I will have more Easter cards and projects coming in the following weeks so I hope you still stop by again next week! Thanks for looking today and I hope it gives you some inspiration to make your own Easter cards.